Zhuzhai archaeological site is situated at Zhengzhou’s Hi- Tech Development Zone, which is 500 m east from Zhuzhai village in Gouzhao town. 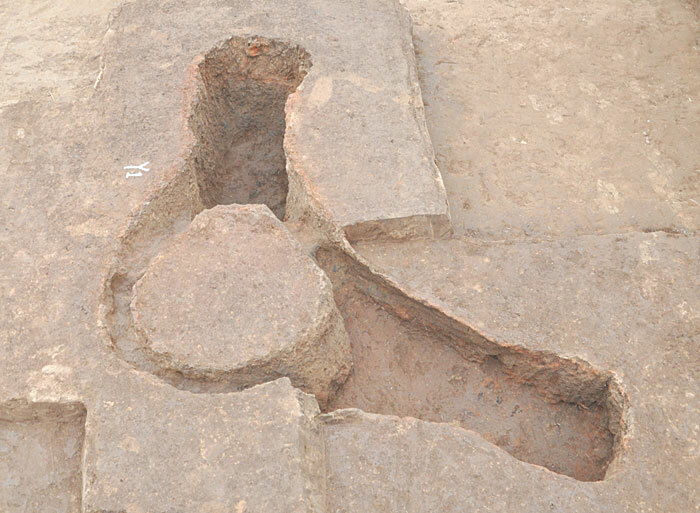 In order to facilitate the development of this zone, the Zhengzhou city Cultural Relics and Archaeology Research Institute has conducted an archaeological excavation during which 5000 square meters were exposed. Until now, a total of 325 features including 225 ash pits, 63 burials, 25 urn burials, four house foundations, five pottery kilns, one ash ditch, one stove and one pathway were identified. These cultural deposits date to Yangshao period, Shang dynasty, Western Zhou period, Warring States period, Han dynasty as well as Tang and Song dynasties respectively. Among the remains discovered, relics from Yangshao period were preserved in excellent condition. New remains were also found from Peiligang culture. Remains from the Peiligang culture included ash pits in oval and circular shapes. Finds ranged from pottery, stone tools to animal bones. Although most of the vessels were brownish coarse ware, a certain number of reddish potteries were also found. Pottery analysis revealed that clam powder temper was added into a small amount of coarse ware. While most of the pottery was plain, a small number was decorated with combed, stamped or incised pattern. Among the vessels types were dishes with three legs, double handled ewers with small mouth, ding tripod and pots with huge belly. Finally, different stone tools including a polished stick were retrieved. The features from Yangshao period ranged from house foundations, pottery kilns, burials, urn burials, ash pits, ash ditches to stoves, etc. The house foundations can be separated into semi subterranean dwellings and ground leveled types with passageways, living surface and postholes. Burned clay remains were identified in a section of house F2 and can be regarded as platform for a stove. A compartment wall was identified in house F3. The posthole in house F5 was large and deep and the surface of the hole had been burnt. The bottom part of the posthole was rammed with a clear inner area. Pottery kilns from Yangshao period consisted of a firebox, a fire shaft and a chamber. The firebox was deep whereas the chamber was high. Two fire shafts were connected to both sides of the firebox and surrounded the chamber. A workplace was also identified in kiln Y2. Kiln Y1 revealed a kiln with double fireboxes, one on the west side and the other in the northeastern part of the chamber. Furthermore, a complete firebox could be unearthed in kiln Y4. The shapes of Yangshao period ash pits included circular, oval or irregular forms. A circular bag shaped ash pit had subsequently been modified for storage purposes. Most of the burials from Yangshao period were rectangular earth shaft tombs in which most of the dead are in extended supine position. Some of them contained stone spindle whorls. The number of urn burials was relatively huge and the grave goods included pottery pot, ding tripod, dishes, jars with wide-open and sharp bottom, etc. A certain number of jars with wide-open and sharp bottom were covered by placing a reversed dish onto them. Infant skeletal were identified in these urn burial. Ash pits showed circular, oval or rectangular shapes but most of them were bag shaped with modifications for storage purposes. An ash ditch was found with 2.2~3.5 meters wide and 0.95 meter deep, and a boar skeleton was found in the bottom of upper deposit. Artifacts from Yangshao period included pottery as well as tools made from stone, bone or clams. The pottery was mainly grey in color with a small number of reddish vessels. Personal garments such as plain, attached, incised and lengthy beads patterns were found. Most of the painted potteries were white or black painted on red background. Decorations included circles, triangular pattern at the edge, net pattern, comb pattern and solar pattern. Apart from vessels such as ding tripod, jars, dishes, basins, stem cups, jars with wide open and sharp bottom and other artifacts like spindle whorls, rings and balls were discovered. Stone tools such as spades, axes, knifes, chisels, sickles, spindle whorls and polished sticks were unearthed. Bone tools include hairpin, dagger, etc. whereas clam tools were mainly used as sickles. Features from Shang dynasty of the Zhuzhai site included house foundations, burials, a huge activity surface and ash pits. The houses were semi subterranean with a passageway, stairs, living surface and a storage cave. Most of the burials were rectangular earth shaft pit in which the dead was in extended supine position. However, only a few waist pits were identified. A huge living surface extended over four test pits. Its surface was covered by charcoal residue; further analysis is needed to reveal its function. Finally, artefacts such as li tripod, jars, gui vessels, zun vessels with wide open and two tubular bronze ge daggers were unearthed. Among the remains dated from Western Zhou unearthed at Zhuzhai site were rectangular earth shaft tombs. All individuals were buried in extended supine position facing west but only a few had been given grave goods such as seashells. Features from Warring States period included burials, ash pits and a passageway. A number of rectangular earth shaft tombs were found in which the dead was in extended supine position. However, some individuals were laid in contracted position. Most of the graves had an inner and an outer coffin. Grave goods included pottery such as jars, combinations of jar and cauldron or combinations of ding tripod, stem cup, ewer, basin and yi vessels. Lids were found in most ding tripod, stem cups and ewers. Personal belongings such as bronze belt buckles, jade huang pendants, jade rings and bead materials were also found. The passageway of the Warring States period was 3.5m wide and 14.5m long were cleared. Four ruts in two separate sets were identified. The number of Han dynasty remains identified at Zhuzhai was relatively small and included ash pits and a pottery kiln. The kiln was combined with a workplace, firebox, chamber and passageway, and the firebox was deep. Artifacts are mainly flat tile, round tile and etc.